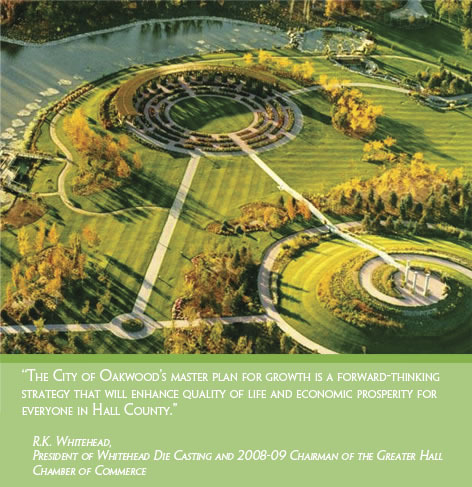 Please take a moment to let us know what you think of Oakwood 2030 and the Downtown Commercial Center Master Plan. It is a legacy for the community and for all of Hall County, and its success is dependent on local citizen and business support. Your ideas and feedback will help create the best quality of life that will benefit everyone living, working and playing in or near the City of Oakwood. Contact the City Manager or any member of his staff at 770-534-2365 or comments@oakwood2030.com. "The web site is great and the plans are even greater. I have been hearing all about the new plans and it is exciting to know that Oakwood will be such an awesome place to live, work and raise a family. It will be so exciting to see the changes that take place in the future. My thanks go out to the City of Oakwood for having such a heart for the community. " "I have followed the 2030 planning in Hall County from its beginning. I have been an Oakwood/South Hall resident for more than 30 years. I believe in our future in Oakwood and Southern Hall County. The Oakwood 2030 Plan is a positive view of our future. We can see great infrastructure growth and the encouragement of the technology industry in our area and future. 2030 stems from all of our comments, and if the course is held true, the Oakwood area of Hall County will be a center people seek to be a part of. " "Impressive Master Plan. That it exists is a sign of strong and visionary leadership; that it encompasses such imagination and creativity is clear proof of bold thinking. We feel fortunate to live in this community." "My congratulations to Mayor Scroggs and his administrative people. They have done a fantastic job in planning for the future. This small town has grown from a Mayberry USA community to the modern community that it is today. I was born in this community in the old hotel (which was torn down several years ago). I am so proud to be a native son." W. Richard Merritt, Loganville, Ga.
"This is so very exciting!!!!!! What is the earliest we can expect to see changes like land acquisition and construction? In what area of Oakwood are the changes expected to begin? WE ARE ALL THIRSTY FOR INFORMATION OF THIS VERY EXCITING NEWS!!!!! Thank you for having the vision to build such a gorgeous and family friendly hometown!!!" "Looks beautiful, I can't wait until it is built"! "Wonderful vision! I lived in Oakwood for awhile when I moved back from Florida, and it was a quiet and very peaceful city. Being familiar with Disney and its developments I tried to get people interested in this type of development for years. When the time comes I would love to invest my money in this type of community. However, I believe you just hit the tip of the iceberg of the things to come and the endless possibilities. Through wise investments this could be a tax free community, and never short the city of funds to propel this project forward with enough money to own and maintain a healthy community and attract business investors. Oakwood would become the standard others aspire for and good jobs would come". "I like the plan everyone is doing a good job. Thank you."